The Exhibition Center of the airport terminal 1 (T1) is located in room C of the national area, between gates 4 and 5. It is open to the public 24 hours a day throughout the year. 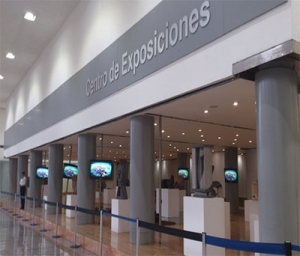 In this space, exhibitions on diverse topics connected with aviation and its development in Mexico are constantly exhibited; as well as expositions related to the Mexican flora, fauna and ecosystems; artistic and cultural performances of renowned artists and other exhibitions that contribute to the spreading of the cultural and tourist richness of Mexico. Also, in the later part, busts of several important persons that significantly contributed to the development of aviation in Mexico are exhibited. 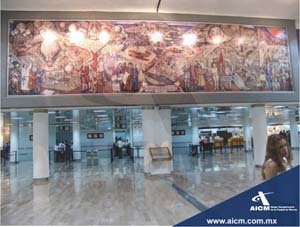 Additionally, we invite you to visit the mural entitled THE CONQUEST OF AIR BY THE MANKIND, which is housed in room B of the ambulatory, in the national area. This mural was created by architect Juan O’Gorman and represents a journey through the history of humanity and its struggle to break all limits, symbolizing the beginning of aviation and its evolution until modern times.